20-sim uses XML-RPC as a protocol to communicate scripting functions with external packages. By default the XML-RPC interface is turned on only for your local computer. 2. Go to Tools/Options and select the Scripting Interface tab. 3. 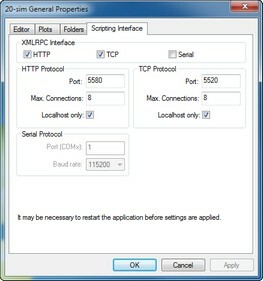 To enable the 20-sim scripting support, make sure that the HTTP and TCP checkboxes under XMLRPC Interface are enabled. By default, 20-sim will only accept scripting connections from your local computer (Localhost only option is enabled). Your firewall may generate a warning message and ask you to allow network communication for 20-sim. 4. Set the firewall to allow communication.